Want to learn the way to convert PDF to image? I think you have also found the necessary of the PDF to image conversion. Although PDF is widely used for documents sharing among different programs and computer platforms, there are times you need to convert them to image formats, especially when you need to attach PDF pages into a presentation, or you want to embed a PDF into a webpage. If you are looking for a way to convert PDF to image, look no further than the Coolmuster PDF Converter Pro, which can easily convert Adobe PDF to popular image formats, such as JPG/JPEG, BMP, PNG, GIF, TIFF, etc. No matter how complex your PDF file is, the output image is always as same as the original PDF file, no quality loss. 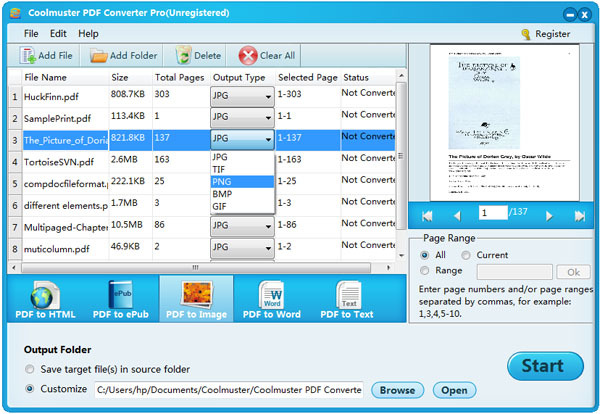 This PDF to Image Converter is fully compatible with all Windows platforms, including Windows 8/7. Tips 1: Coolmuster PDF Converter Pro also allows Windows users to convert native PDF files to editable Microsoft Word, Text, ePub and HTML Web pages. Tips 2: Mac version is also available, just click PDF Converter Pro for Mac to get it. How to Convert PDF to JPG/JPEG/BMP/TIFF/GIF/PNG? Double-click the quick start icon on the desktop to launch the PDF to Image Converter, click the Add Files or Add Folder button to upload the PDF files you want to convert. You can upload up to 200 PDFs at one time and convert them simultaneously. Click to choose the conversion type you need for the output file. You are provided with 5 conversion types like PDF to Word, PDF to ePub, PDF to Text, PDF to Images and PDF to HTML. Here, you should choose PDF to Images conversion type and choose any output image format you need. Select an output location for saving the converted images by clicking the Browse button. Note: You can preview the imported PDF in the thumbnail window in the right window and customize page range for the PDF files to convert. Default page range for the PDF to image conversion is All Pages. After finishing all the settings above, you should click the Convert button on the right bottom corner to begin the PDF to image conversion. The conversion process will be finished very soon. Then, you can find the converted image files directly by clicking the Open button. That is all! 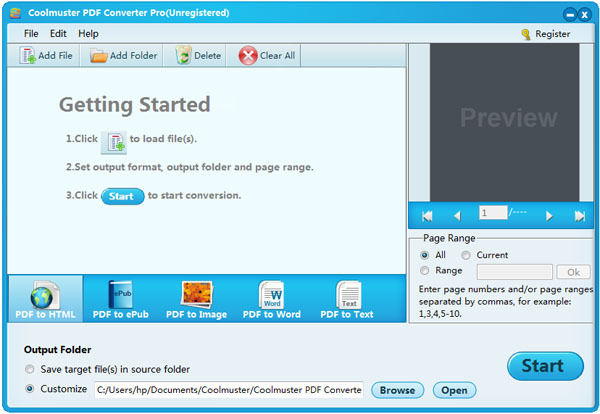 Just get the Coolmuster PDF Converter Pro to help you achieve your PDF to image conversion goal right now!